If you’ve already picked up some precious metals, you certainly have a right to be proud. You are probably quite comfortable with your decision to turn some paper money into sound money. Over the past several years, you've come through the barrage of bad news and warning after warning of the economic dangers facing your family and your country. That onslaught changed your outlook. You paid attention and understood having part of your savings portfolio in gold and silver is crucial. Importantly, and something you may not have realized, is that you overcame enormous forces working against you and dedicated to your ruin. You congratulate yourself that you have a head start on surviving a devastating financial crisis that may yet come at any time, and you just can't keep that to yourself. You want to share your knowledge about the imperative of owning precious metals with those you care about. Out of deep concern for their well-being, you want to urge them to take action like you have, so you confidently suggest they should own gold and silver. How can you fail, you wonder, to convince others of dangers so evident? After all, you know your facts: paper money is debt, backed by nothing; no paper currency has ever survived massive over-printing by any government in history; gold and silver have been true money since antiquity with an undisputed track record of holding value through all wars and natural calamities; all governments on Earth are on the same path to drive their nations into ruinous debt with no regard for their citizens; simple math shows our national debt can never, ever be paid; and history proves conclusively from Ancient Rome to the old Soviet Union that no civilization can escape the massive economic chaos that comes with devaluing their own currencies. You might add the simple observation that fiat money is created in unlimited quantities by an office clerk tapping on a computer key, while gold and silver coins are produced only after men with courage and dreams have searched the planet, dug the ground, sweated their labors, matched their brawn to a bit of luck, and often found they must then brave thieves and murderers who would steal their hard-earned wealth. I'd say you've got some pretty good arguments there. But they won't work. Not all the time, not very often, and not with everyone you care about. You will invariably get the standard replies, led by the number-one favorite on my top ten list of excuses to never buy gold: If things got so bad, you would not use a gold coin to buy a loaf of bread. I estimate my own record of selling the gold and silver story to my friends and loved ones at a 4% success rate. The success reported by friends who own precious metals is a bit lower, between 2% and 4%. Another informal survey I saw years ago found similar, very low results of around 3%. There is a very good reason that gold and silver are a tough sell: gold and silver have been drummed out of the American psyche over the past eighty years, starting in 1933 with FDR's war on gold ownership. The drumming continued on through 1965 when LBJ ordered silver out of everyday U.S. coinage, trading mystery metal for the silver in our pocket change. 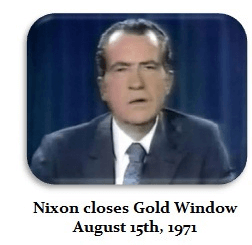 Nixon finished us off in 1971 when he defaulted on America's promise to foreign nations to redeem their dollars for our gold. That U.S. government campaign to destroy America's link to sound money was conducted on purpose and with masterful results. It was meant to separate Americans from their Constitutional ties to a sound economy, so that government could go on an eighty-year spending spree, easily outpacing the already tawdry reputation of drunken sailors. At first, the takeover was slow. Government first needed to gain control over formal education and later was happily joined by the lapdog media. Wall Street was never a problem. It was on board the whole way. Together, they convinced Americans that true money is the plastic credit card, not gold. Together they successfully redefined wealth as debt, replacing thousands of years of monetary history in just eight short decades. Your government used your schools, your once-free press, and the financial industry to shamelessly steal your economic power in order to have that wealth for itself. The dirty secret all governments hid from you, and hid very successfully, is that gold is the only money those governments trust or truly care about. Governments don't trust each other’s paper money, nor contracts with each other, nor treaties, nor promises, nor handshakes. 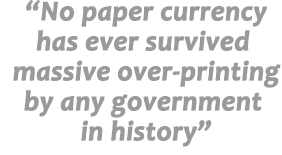 When governments wish to seal the deal, they honor and trust gold above all paper currencies. That's why all governments keep their dealings involving gold secret, and why it would take an Act of Congress, literally, to properly audit and account for America's gold. That's also why the Establishment Media ignores or corrupts the gold story, because they play on government's side. Your government prefers you hold debt, not wealth. They want that wealth in their hands, not in yours. Your government worked very long and very hard to ensure Americans don't even think about gold. That's what you're up against when you begin to tell the gold and silver story to someone you care for. 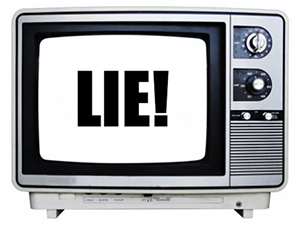 You swim against a tide of misinformation, corrupted education, and outright, blatant lies, all thoroughly believed by too many Americans. It's a tough challenge for you to change opinions, habits, and beliefs that were eighty years in the making. You will find only a few will pay the same attention you've paid. But reaching those few should be a worthy goal, for now. The free market itself will one day force everyone to pay attention. Meanwhile, answer those ho-hum excuses about gold with honesty. Admit that when things do go bad, you too would never use a gold coin to buy a loaf of bread... you'd use that gold coin to buy the bakery!